We live in an electric universe. Space is filled with plasma, the fourth state of matter. Plasma consists of hot ionized atoms and is influenced by magnetic fields. Plasma also conducts electrical current. Such current flow creates magnetic fields which affect the structure of the plasma. The energy states and resulting structure are so complex that scientists are not able to adequately model plasma phenomena mathematically. However, we have a great deal of empirical knowledge of plasmas since they have been used in industry for over a hundred years. Arc lamps and arc welding processes create plasmas. The familiar red glow inside the glass tube of a neon light is actually a plasma at work. Is the sun actually a ball of lightning? 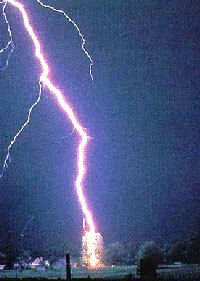 Lightning is a dense stream of luminous plasma, a powerful electric discharge. But where does the energy in the form of electric charge come from? New low-light photographs of the upper atmosphere (lower left photo * ) show that less-dense forms of plasma discharge occur as high as 70 km above the surface at the same time as the lightning. Planet Earth appears to be exchanging electric charge with surrounding space which is filled with solar plasma. Other glow discharge phenomena have been detected between the ionosphere and the center of a hurricane. Atmospheric storms may be driven by energy from the larger environment through which Earth travels. * (Above left image - These high altitude discharge patterns are known as Blue Jets, Red Sprites, and Elves. From Discovery magazine, 1997. Plasmas do not behave like a gas. They develop structure when a charge gradient produces the movement of electric current. The current flow and resultant magnetic fields cause the plasma to form filaments that twist together into ropes. As long as the current continues, the structure remains intact. In mid-1997, the Soho satellite detected a plasma structure issuing from Venus and almost reaching the surface of Earth. The report described the structure as "stringy." Such a structure could only remain intact if a current were continuously flowing from Venus to the surrounding space via the plasma tail. The discovery supports the idea that Venus assumed its present position in the solar system only recently, and has not yet achieved charge-equilibrium with its environment. Interestingly, ancient names of Venus include the Long Haired Star and Bearded Star. Symbols and glyphs that carried the meaning "planet Venus" also carried the meaning "comet." We suggest that in ancient times, this same "plasma tail" of Venus emitted a visible glow by the same mechanism that comets do today, plasma discharge. The Valles Marineris stretches 4,000 km across the face of Mars, a massive gouge that could swallow a thousand Grand Canyons (click image right). Water erosion and normal geological processes are not adequate to have produced a mark of this nature or magnitude. A massive electrical discharge is. Our research indicates that planetary bodies have significant charge, and when they travel sufficiently close to each other for their plasma sheaths to interact, electrical discharges are exchanged. The event blasted an estimated 2 million cubic kilometers of rock and soil into space, some of which falls to Earth even today. The mythical stories of ancient cultures recount a great warrior whose face or body displayed a massive scar. (See the North American Scarface, Aztec Tlaloc, Norse Thor, Greek Theseus, Hindu Indra.) In several accounts, the agent of this scarring is a stupendous lightning bolt. Comparative study will identify this imposing "scarred" figure with the planet Mars. This "sinuous rille" stretches 250 km from one end to the other (click image right). Countless rilles of all sizes have been discovered throughout the solar system. A close examination shows that these rilles could not have been formed by flowing liquids. A careful examination of the strange markings that cover Jupiter’s moon, Europa, show that no conventional explanation adequately explains their cause. Rapid electric discharge could have produced these effects (click image right). During those times when the legendary Gods in the sky engaged in battle with each other, it was said that they used the thunderbolt exclusively. At times the thunderbolts flew so furiously, it was as though the sky had become filled with arrows.